I went into the Kindergarten classroom to visit with the my little friends. They were all sitting at round tables and doing their work on individual chalkboards. As I passed by one of the tables, a little boy held up his board to make sure I noticed his work. So I walked around the table to get a closer look. What I found was a precious picture and a precious face! Students lining up after recess before heading back into classrooms. On Tuesday, we had a great meeting with two of the directors of MPP, Verona Val and Michel Mulaire. The focus of the conversation was on the sustainability of the school. Mulaire starting by talking about how MPP got involved with the school. He explained that building and operating a school is not what MPP does. Schools are complex and have their own special requirements. But the directors of MPP decided to take on this challenge in their continuing efforts to help the refugees of the earthquake. He said that no matter what the government does, MPP will always be involved in this school. This was a great relief to our group because we are concerned about the future of the school once we stop providing financial support. MPP knows that our financial contribution goes away in 3 years and they are very appreciative of our continued support beyond our initial 5 year mission. So that led to the subject of the sources of income for operating the school going forward. We asked about the agricultural initiatives. We have contributed a lot of money to buy goats, plant manioc and plant moringa. But these have not produced any income. To which Verona replied, "You are correct that we haven't seen any income … Yet!" It seems that manioc takes a minimum of 18 months before it can be harvested. Moringa likewise can take a couple of years before producing significant yield. Offspring of goats are being giving to families who have not yet received a goat. The drought has delayed progress. Those of us in America are impatient for our return on investment. But, these projects were funded two years ago and it's too soon to be expecting results. 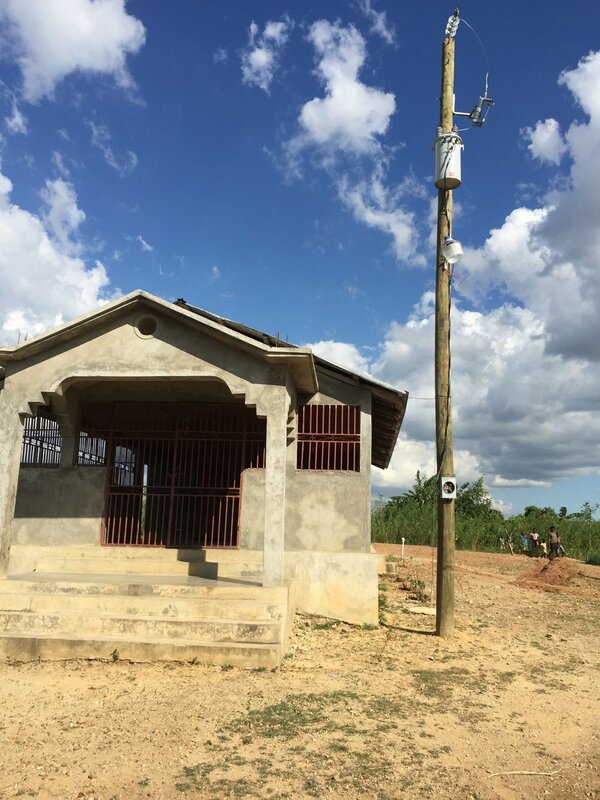 We are comforted by MPP's confidence that, in time, these project will result in income to support the villages and the school. This is my fourth trip to Haiti and the EcoVillages. I remember my fascination with looking out the window on my first trip at all the unfamiliar sights as we drove from Port au Prince to the Central Plateau. I must have taken 200 photos through the windows of the Land Cruiser on that trip in 2015. This trip feels different. I still look out the window but the sights are now all too familiar. I am happy to let others gawk at the view and take lots of photos. I coordinated this trip. The job is all about the logistics. I am excited about traveling with new people with diverse backgrounds and life experiences. Now I am the tour guide, being sure to point out significant sights and relate them to our pre-trip discussions. We stopped at the hospital in Mirabalais. It's not a very impressive building by American standards. But it is striking in contrast to its surroundings. The hospital is mentioned several times in To Fool the Rain which was the book we read collectively before the trip. Now, we observe the setting and contemplate the difficulties for people in the surrounding hills who have to carry sick family members to this facility. We move on and arrive after dark at our home for the next 6 nights. This is Sant Lakay at MPP. It's their training center and our home base. The guesthouse provides modest accommodations including a bed and shared bathrooms with cold running water. It's primitive compared to lodging in the states. But we don't complain and recognize that we have it better than many who live here year round. The guesthouse has new beds and a fresh coat of paint. All our meals will be provided here as well. The ladies in the kitchen will start their day earlier and stay late into the evening to make sure we have 3 meals a day. The best part of the food is that it's all organic and fresh. Bananas, Papaya, and Mango are served every day. Vegetable dishes always include beets, carrots and tomatoes. Protein is mostly goat and sometimes fowl. When we told them that Ian is vegetarian, they made fish especially for him. We are treated royally in Haitian style. Their resources are meager but their hospitality is warm. God works in mysterious ways. Blessings appear when least expected. We are, and have been, surprised by grace at almost every turn during our very full days in Haiti on the Central Plateau. Our partners MPP and the primary School of the EcoVillages welcome and trust us. They anticipate our questions, our reservations, our skepticism, our reluctance, as well as our openness, our love and our support. They admit their mistakes and the difficulties and complexity of our common enterprise of relocating urban dwellers displaced by the earthquake to the rural agrarian expanses of the Central Plateau. 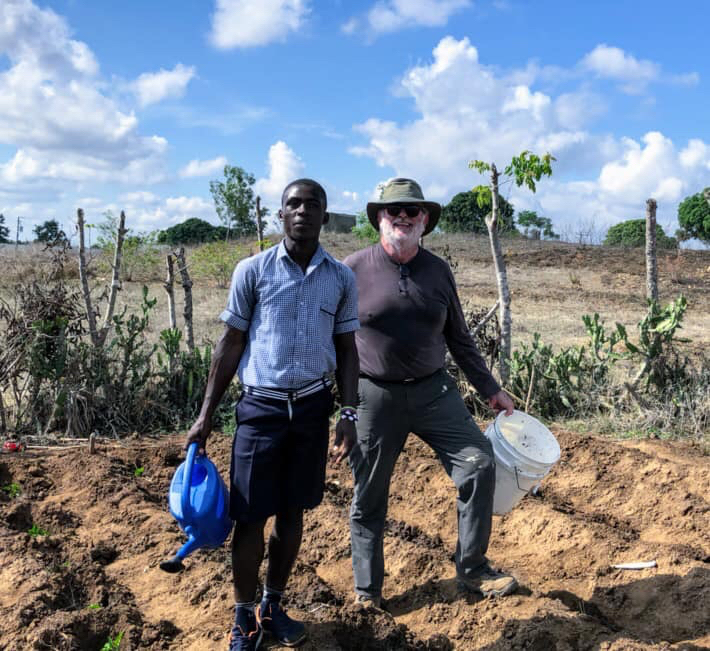 We stand shoulder to shoulder, sharing educational materials and methods, taking photos and making videos, connecting through common daily activities, educational moments, digging, fertilizing, watering and planting together seedlings in the School garden. We are making new friends and enriching existing friendships. We are brainstorming together about growing and improving the primary School and the EcoVillages, adult education, rainwater harvesting, micro-financing of cottage industries. 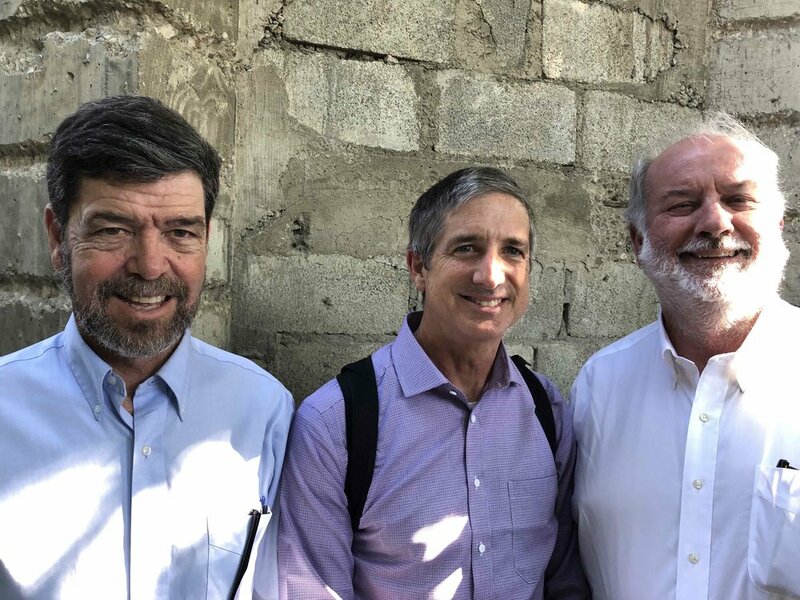 We are truly blessed to be connecting with our sisters and brothers in Haiti. I appreciate this opportunity and our churches that support this collaboration. Thank you. Jeanine and Robert prepare gift bags and letters to present to students and families. Claude and Chris confer after worship with Verona. Pat, David and Bailey celebrate Easter joy after worship. 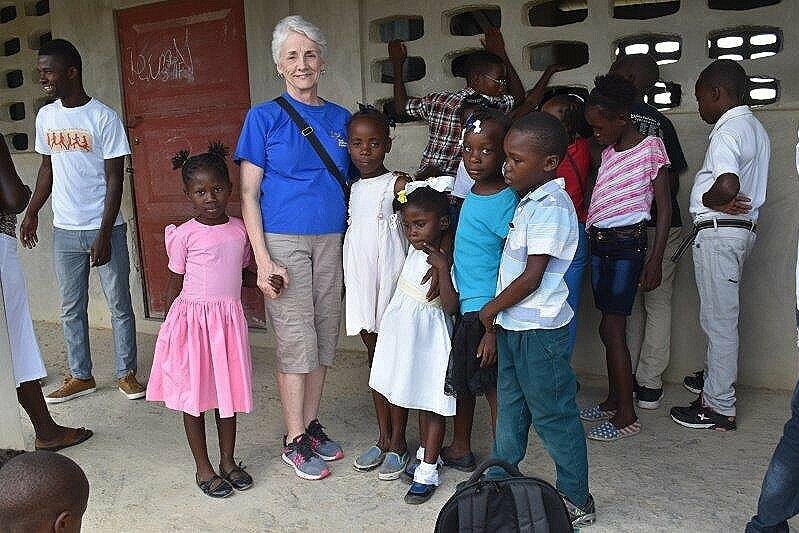 Jeanine holds hands with children at school. Older students line up for school. Becky, Annette and Jeanine enjoy time together. Raindrops, singing and "employed minds"
It’s Raining as I write! Big, fat, beautiful raindrops! Praise God! The drought has been terrible – the grounds are so dry, brown and crumbly. 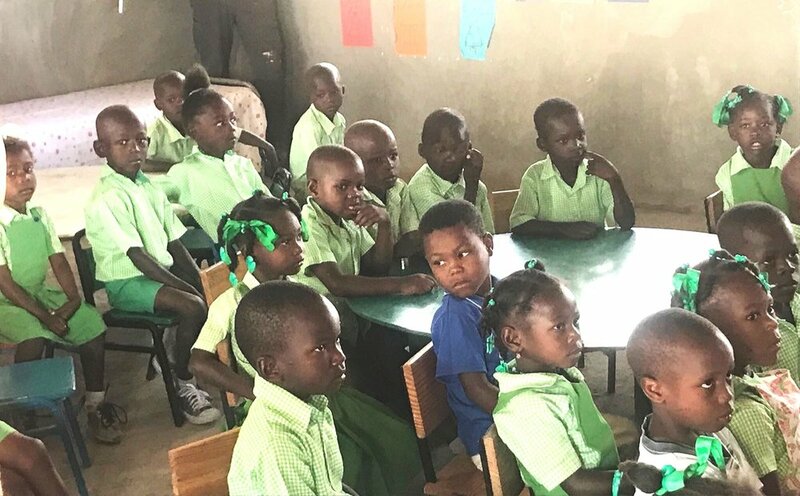 The students listen carefully to the English version of the song they sang to us in Kreyol. This is my first time to return in three years to the Haiti EcoVillage School. Such a blessing to recognize many faces…. And to be recognized in return! Chris and Jeanine have done a wonderful job leading our group. It is so nice to relax and be a strong support person, and to share this beautiful school in person with David. Today I accompanied Jeanine and Robert as a photographer while they presented letters and photos from Lilburn Elementary to each classroom. But my favorite part of the day was returning to the Kindergarten classroom at the end of the day, for them to sing “Heads, Shoulders, Knees and Toes” in French, and we taught them the song in English. I want to teach them the Hokie Pokie—but it is not on our official “to do” list. We will see! We met with the sewing group in the afternoon, and worked through a list of questions that will enable us to talk with Chavannes and our Haiti EcoVillage Partnership Steering committee about a potential investment in completing their training and funding a pilot program. 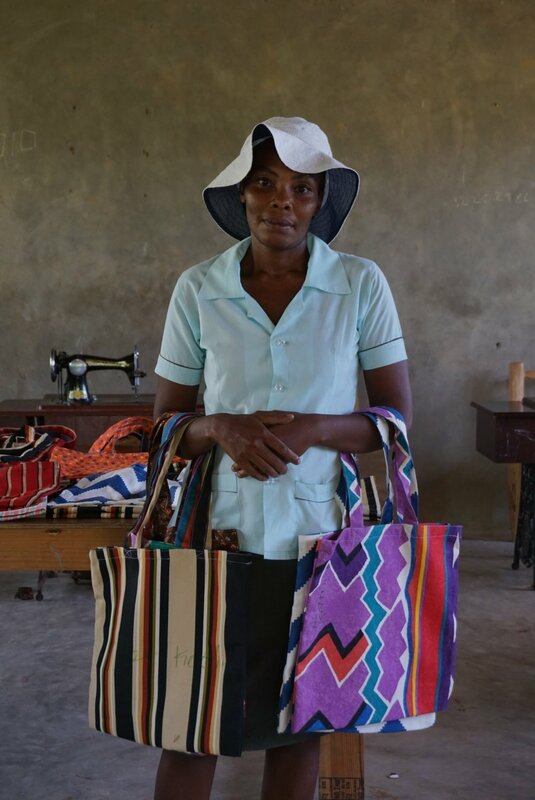 We know that in order for parents to pay tuition for school they will need to find other sources of income outside of farming, and many women who have children in the school have completed initial training but the funding from the original organization has run out. They need additional training to produce high quality products. Highway 3, the road that goes right by the EcoVillages, is being paved, and it has been a big unknown in our travel back and forth from the MPP compound to the school. When it is blocked, our commute time increases by 40 minutes, which was especially challenging when we encountered that yesterday, at 6pm. Other highlights for me today were: having a big group of children crowding around me while a young girl read aloud the Haiti EcoVillage Book in Kreyol; singing the song with the kindergartners; hanging out with children, showing them photos and videos from the day, in EcoVillage One, after our meeting with the sewing group, and before our drivers came to pick us up; and watching David entertain the children with his “tricks”, like doing a head stand and walking on his hands. Last night a highlight was our devotional and centering time, with Bailey leading us, and talking around candlelight about our day and our concerns about various issues with MPP and the school. I love the quote from Wendell Berry “the baffled mind is not employed”. We are baffled by the problems we want to help solve, but at least our minds are definitely employed!!!! And tonight it rained! Precious big fat raindrops! We are praying for more rain so the planting season can begin! 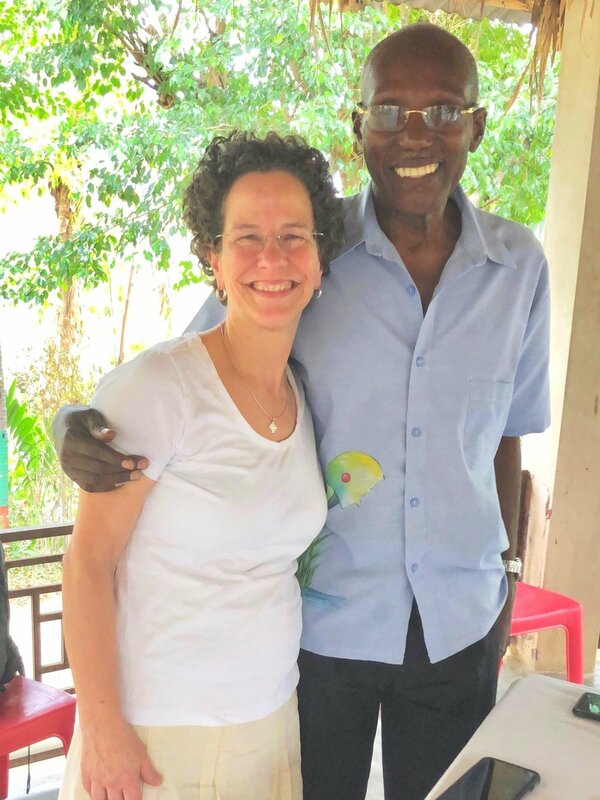 We arrived safely Friday after dark to the MPP compound, ate a delicious dinner of beets, carrots, grilled goat and plantains, planned our schedule with Veronal Val, MPP Director, and slept peacefully. 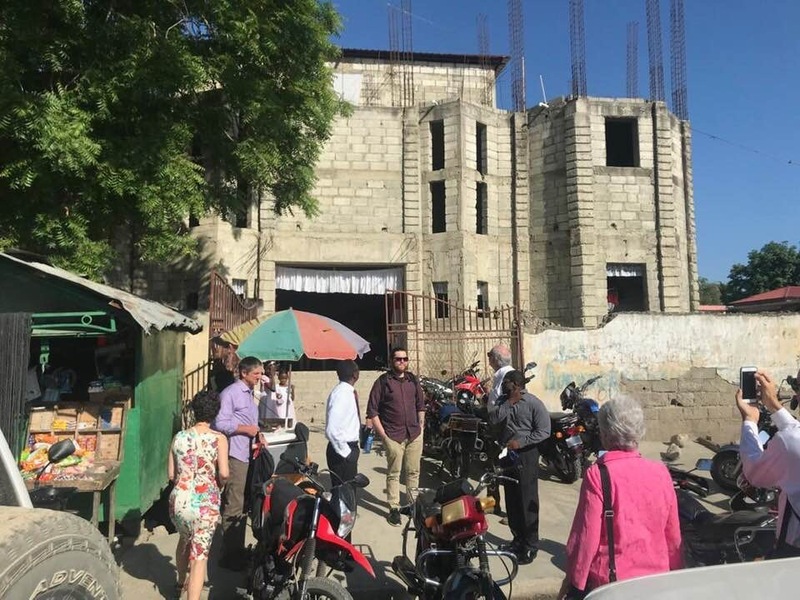 Saturday included a planning meeting with Chavannes Jean Baptiste, preparing Easter gift bags for families, and a trip to the Hinche market. On Sunday we enjoyed soup joumou for breakfast before we celebrated a joyous Easter worship at Verona’s church (pictured below). In the afternoon we went to the school. Director Ramain gave report cards to the parents, and we had a meeting with them. We learned the school serves many children living outside the EcoVillages. My wife and I like to travel “light” when we go on vacation. It just makes it easier to get around. In fact, we recently spent 13 days in Europe using just carry-on bags! But, when go to Haiti, lots of generous people give us things to take. 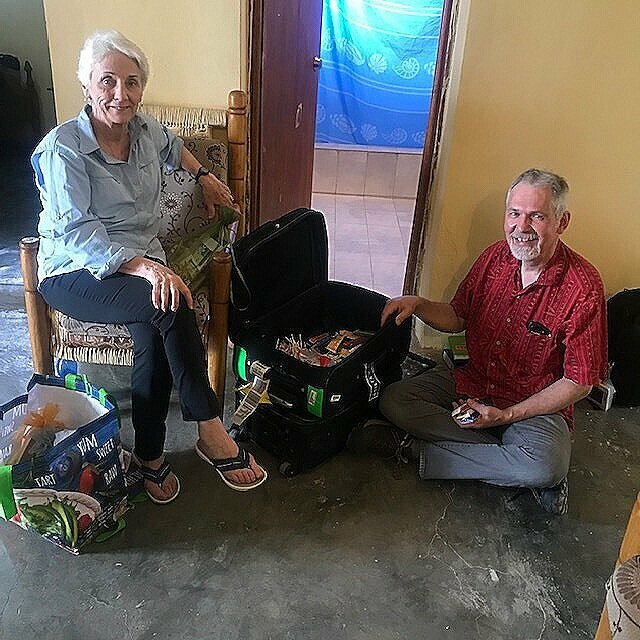 For this week’s trip, we have school supplies, soccer balls, tools, a laptop computer and various other gifts for the people of the EcoVillages. Yes, the people are materially poor and the school has limited resources. So, all this stuff is very welcome. We hesitate to ship our stuff because there is a good chance it will get lost. Instead, we pack it in 50lb packages and check it as luggage on the airplane. We pack “heavy” on these trips. So, this week, keep watching blogs about our journey. See how the stuff you donated get to where it’s needed most. 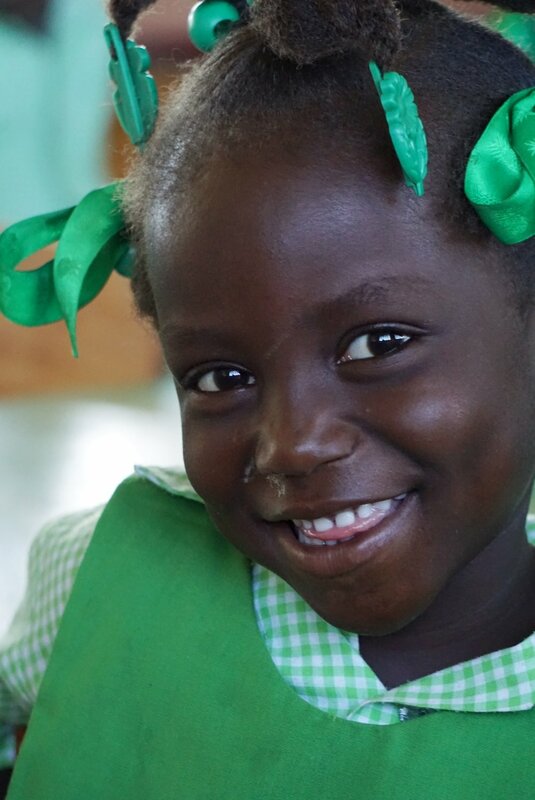 “Who knew how much fun a fund-raiser could be!” We look forward to sharing joy and accomplishments and learning as we gather for our annual Flavors of Haiti. Here are some photos and quotes from previous years. We hope to see you there! "DO NOT TRAVEL" is the warning given by the US Dept of State about going to Haiti. I am paying particular attention to these warnings as we have a group of 10 people planning to go to Haiti in April, 2019. This is the same warning that the State Dept gives about travel to places like Iran, North Korea and Afghanistan. Why such as strong warning about traveling to Haiti? It is not surprising if you don't know about the political unrest in Haiti. The only US newspaper that consistently covers events in Haiti is the Miami Herald presumably because of the large Haitian population in South Florida. There have been a number of protests in Haiti of late. Some protests were violent and some people have died. 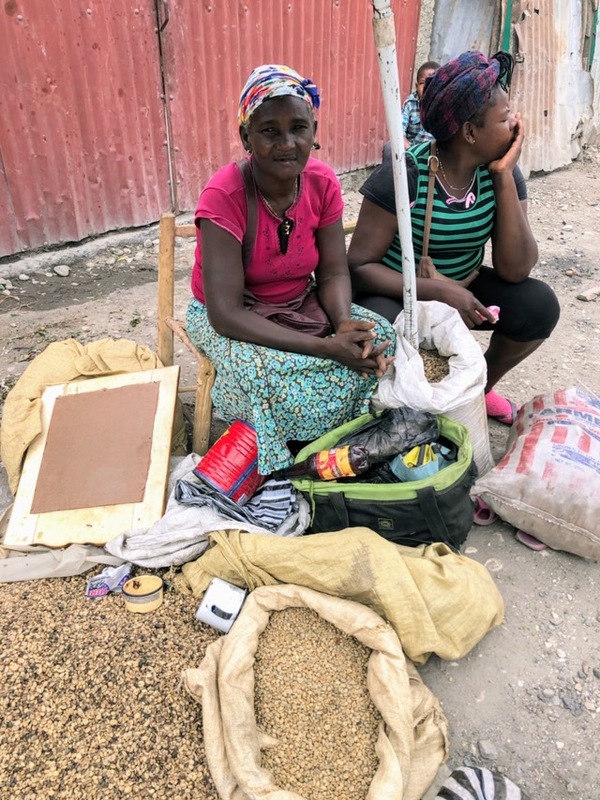 On the 33rd anniversary of democracy in Haiti, opponents of the current president, Jovenel Moise, staged protests about continued political corruption, fuel shortages and rising inflation. The protesters want the president to resign but he is unwilling to do so. He is determined to finish his 5 year term as the country's leader. The people who suffer most from these events are the people we seek to help. 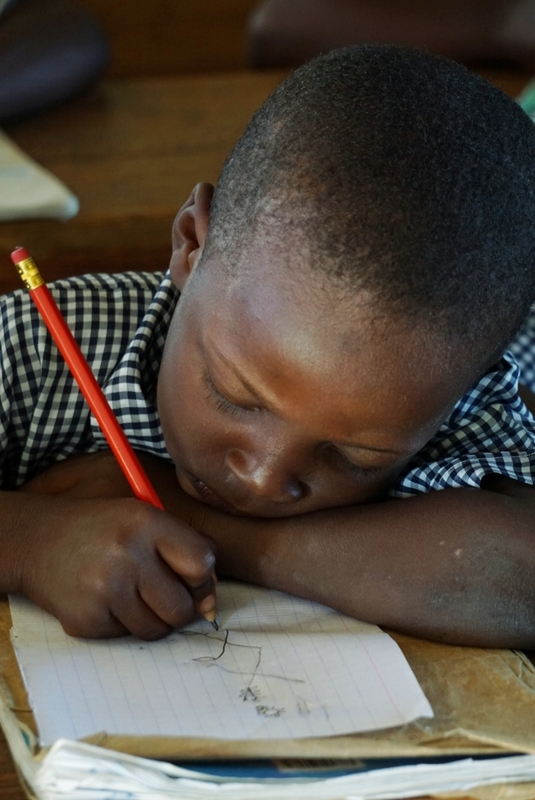 Without groups traveling to Haiti, many important mission projects are put on hold. Local people who get income from helping foreign groups will go without that extra income. We continue to plan for our trip in April in the hope that it will be safe for travel by then. We rely on our friends who live in Haiti to let us know what it is truly like there. After weeks of unrest, things seem to be settling down. One of our friends reports "life is back to normal again". So, about that State Dept warning, it's important but it's not the only factor we consider in our decisions about travel. 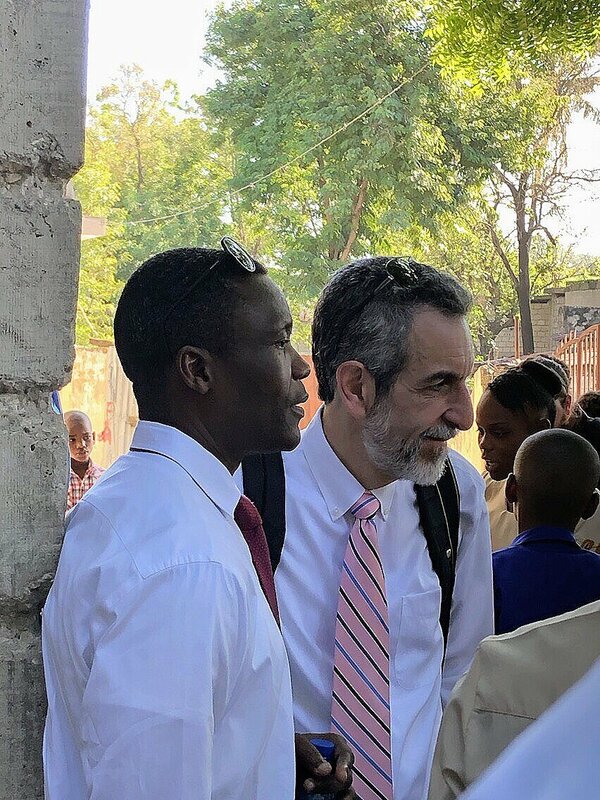 We ask for your prayers for good decisions concerning our travel, a successful mission journey whenever it can take place and for political and economic stability for the people of Haiti. I run. OK, so it's more of a jog. I started running because all the medical community suggests that a healthy lifestyle includes at least 3 periods of cardio-vascular workout per week. I choose running. It doesn't require a gym membership or fancy outfits; just a good pair of shoes. I can do it anywhere. On Thursday mornings, I frequently jog from my house to Eagle's Landing for the men's breakfast and bible discussion. Sometimes it's dark, sometimes cold and maybe wet. It's uphill on uneven ground and the cars are always driving too fast. So why do it? I do it for the challenge… and because I can. After recently explaining this to the men attending the breakfast, my 85 year old friend Charlie leaned over and said "just keep doing it as long as you can." So, there it is. Very simple. I do because I can. I have been given much. I was born in a time of relative peace in the world because of the sacrifice of previous generations. I was given a healthy body, a strong mind and the opportunity to succeed at whatever I chose to pursue. But, for many people in this world, such opportunity doesn't come so easily. I have been given much so what is expected of me? I like a challenge. Typically, the things that are most worthwhile are hard to accomplish. It would be easier to drive my car to the mens breakfast but I wouldn't get that cardio-vascular benefit. What do we do with this? It's OK to have wealth, be self-sufficient and have a comfortable retirement. But we also must be mindful that our success is also a gift. "From everyone who has been given much, much will be demanded." So, aren't there plenty of easier ways to give back; to do God's work? Why go a place where the culture is unfamiliar, it's hard to get to and you can't speak the language? I like a challenge. When called to help people in a remote part of Haiti, we knew it would be tough. We knew there would be a great chance that we may fail. But we also knew God had a plan for us. 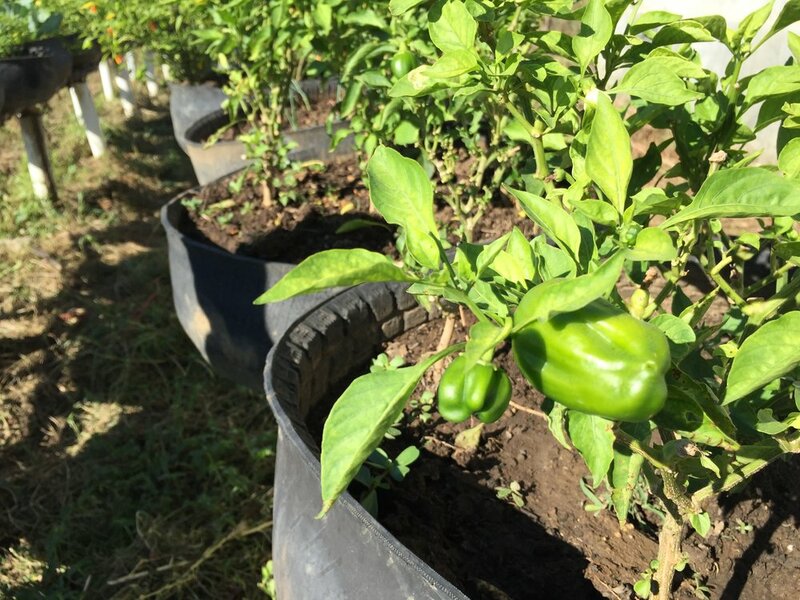 We partnered with a social justice organization in Boston and a Farmer's Co-op in Haiti. We challenged the Haitian people. If you want a school for your children, you design it, you build and you run it. Let us know how we can help. We further challenged them by telling them that we'll help them get the school going but we're not going fund it forever. You have to figure out how to keep it going after we're gone. None of us had ever built a school before. It's hard. We may still fail. But we live in the knowledge that we are doing what Jesus instructed us to do. "… be rich toward God." We must do what we can as long as we can. It's hard. But it's worth it. Moringa, hibiscus, bananas, beans—beauty surrounding the houses in EcoVillage 1. Our travel team is listening, meeting, watching, sewing, talking, playing and absorbing all the news and needs. With deep gratitude for this Partnership, they continue their work today. I’ve included two photos they were able to send this morning. The rains have arrived in the Central Plateau, and it is a sight to behold. The countryside is lush, the rivers are full. Papaya trees bear many fruit and the breakfast passion fruit juice was rich with taste. As Claude and I stood at the entrance to the Community Center for EcoVillage 1, he asked “But where are the houses?” In the early years you could stand there and count all 10 houses. Today, you can see some roofs and paths to those houses. What you see is papaya trees, moringa shrubs, bougainvillea flowers, banana trees and bean gardens. 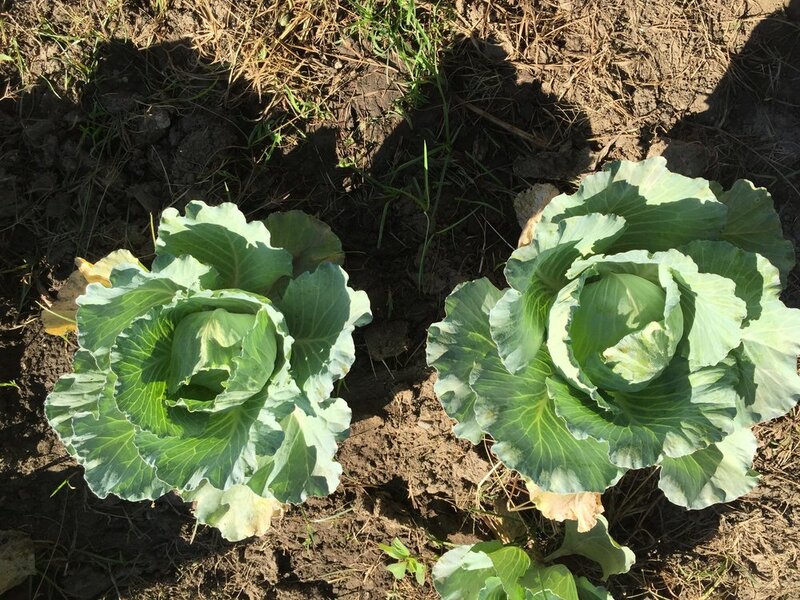 What a relief for people who two years ago went hungry during a year-long drought. This is the break from hardship they deserve after years of struggle since their homes collapsed in the earthquake. It is good to return to the EcoVillages to see their promise being fulfilled — at least for this year. What about the school, you ask? Today we took the all-school photograph. 264 students, preschool through 7th grade. There were 170 students last year. We hope to send photographs tomorrow. The team has arrived safely with energetic enthusiasm. The wifi signal is too erratic to send pictures tonight. 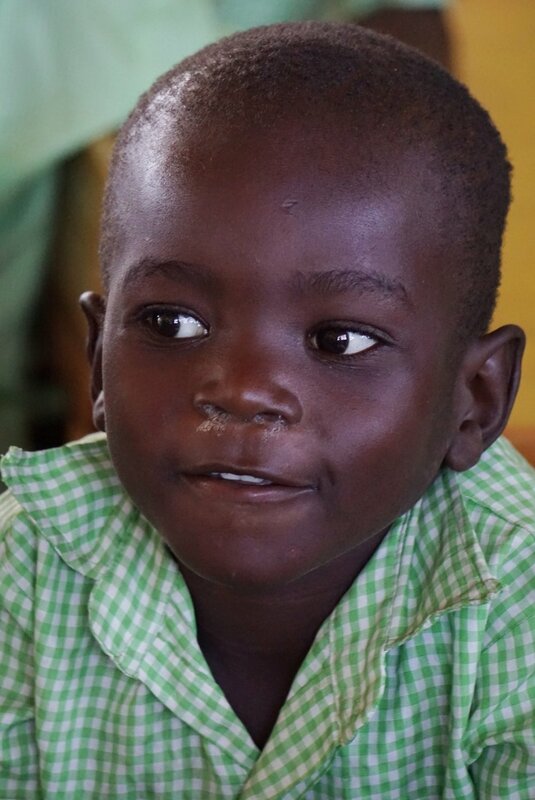 Tomorrow begins early with a trip to the school to greet the children as they arrive.